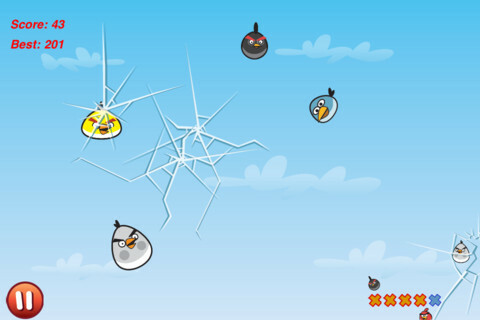 Cut the Birds is an action based application by SolverLabs which presents itself as a parody of some of the more popular mobile apps. The first thing everyone seems to notice about this game is that it utilizes the characters from Angry Birds in a humorous way. The gameplay itself is nothing like Angry Birds, however, and actually presents itself more akin to the popular iPhone app , Fruit Ninja. The same rules apply for the two different applications: You must cut your targets in half by swiping your finger across the screen. However, do not let them get past you and do not accidentally slice a bomb, or it’s game over. And in this particular installment, the targets you’re trying to cut in half just so happen to be the very characters you’re used to flinging across the screen: the Angry Birds. I found that the app itself was pretty fun, though nothing to write home about. It does provide a few minutes of fun, as you slash across each and every bird, trying to keep them from cracking your iPhone, iPad or iPod touch screen. However, after a while it can get a bit repetitive and starts to feel more like a chore. The increase in number of birds flung will definitely keep you on your toes, and it plays smoothly the entire way through. But there just seems to be something vital missing from this app. And, unfortunately, that feeling does not pass with time and practice. The sound in Cut the Birds is mostly pointless, as there’s no music and the sound effects themselves can get incredibly annoying and repetitive after the first 10 seconds. Also, at points I found the audio cutting back a bit, with some of the sound effects being kind of muffled. The graphics are just okay. They’re not bad, but they’re also nothing special at all. The characters are definitely a step down from their Angry Birds days, most notably the tiny blue one, which looks a bit dull in this app. The reason the lackluster graphics are especially disappointing is because in an app as severely repetitive as this, it needs some rather cool aspect in order to keep you thoroughly entertained. I also very much so would’ve liked to have seen some customization in it. The best thing about the Cut the Birds app is simply the fact that it’s absolutely free. So, while it may not be perfect, it’s a nice alternative if you don’t feel like shelling out the $0.99 for its slightly superior counter-part. Because of that, I’d suggest downloading it and testing for yourself whether or not you’re willing to put up with the lacking graphics and the repetitive play style. AppSafari review of Cut the Birds was written by Joe Seifi on November 2nd, 2011 and categorized under App Store, Arcade, Free, Games. Page viewed 3537 times, 1 so far today. Need help on using these apps? Please read the Help Page.